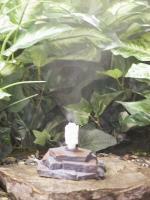 Get the most out of your bird bath with the Birds Choice Avian Mister & Dripper. 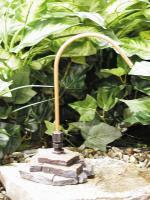 A dripper helps attract a range of larger species and keeps the water in a bird bath from going stale quicker than standing water. But the real treat comes in the built-in mister aspect of the item. This helps attracts warblers and hummingbirds to your bath. At the bottom of the small mister/dripper is a rock base that keeps it standing. The Avian Mister & Dripper comes with a garden hose adaptor and easy-to-follow instructions. It includes a 1/4" dripper tube, dripper fitting, leaf-mister nozzle assembly, rock base, 1/4" to garden hose adaptor, Y-Valve, 50' of 1/4" OD tubing, 2 PVC regulating valves, brass rock mister adaptor, 2 elbow connectors, and instructions.